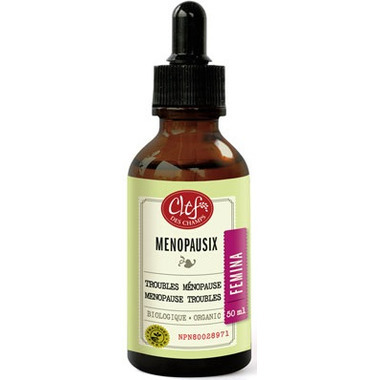 Clef Des Champs Organic Menopausix Tincture is traditionally used in Western herbalism to help relieve symptoms associated with menopause. Non-medicinal ingredient: 50% organic alcohol. Adults: Take 2 ml (40 drops), 3 times per day for 6 weeks. Repeat as needed. Cautions: Consult a health care practitioner if you have a liver disorder, if symptoms persist, worsen or for a prolonged use. Avoid using with all prescription drugs. Do not use if you are pregnant or breastfeeding.